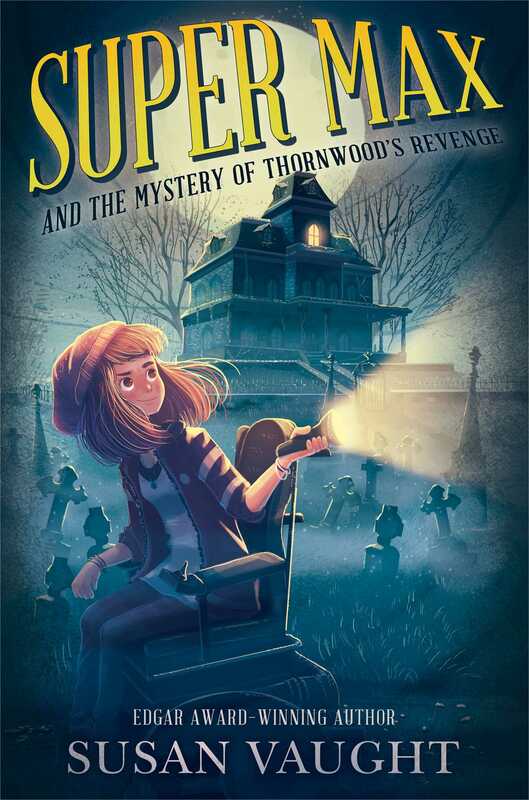 It’s going to take more than a knack for electronics and a supercharged wheelchair for twelve-year-old Max to investigate a haunted mansion in Edgar Award–winning author Susan Vaught’s latest middle grade mystery. Max has always been a whiz with electronics (just take a look at her turbo-charged wheelchair). But when a hacker starts a slanderous Facebook page for her grandpa, Max isn’t sure she has the skills to take him down. The messages grow increasingly sinister, and Max fears that this is more than just a bad joke. Here’s the thing: Max has grown up in the shadow of Thornwood Manor, an abandoned mansion that is rumored to be haunted by its original owner, Hargrove Thornwood. It is said that his ghost may be biding his time until he can exact revenge on the town of Blue Creek. Why? Well, it’s complicated. To call him a jerk would be an understatement. When the hacking escalates, suddenly it looks to Max like this could really be Thornwood’s Revenge. If it is, these messages are just the beginning—and the town could be in danger. Vaught examines the limits of expectations and electrical currents. Under the care of Toppy, her cantankerous grandfather, white, decidedly unsentimental Maxine Brennan is working off a grounding by critiquing sentimental movies and modifying the electronics on her motorized wheelchair. When a hacker threatens Toppy and the town of Blue Creek, Tennessee, with the legendary "Thornwood's Revenge," 12-year-old Max channels her favorite comic-book superheroes and vows to save the day. . . . Stubborn and clever without being superhuman, Max is a refreshing heroine who rises above a so-so mystery. Maxine “Max” Brennan is upset when a hacker impersonates her grandfather Toppy, the police chief of Blue Creek, Tenn., and spreads malicious lies via social media. Invoking Thornwood’s Revenge, a local legend tied to a long-dead town patriarch and a crumbling mansion, the hacker aims to take down Toppy and the mayor, wreaking havoc along the way. As the hacker’s attacks escalate, Max uses her budding investigative skills and pure force of will to find the culprit. The return of her estranged mother, who distanced herself after a car accident left Max in a wheelchair, highlights a softer, less-sure side of the scientifically minded and driven protagonist. Vaught (Things Too Huge to Fix by Saying Sorry) creates a close, strong relationship between granddaughter and grandfather; Toppy seeks to protect Max, but he also acknowledges her need to push boundaries and the fact that her wheelchair is an extension of her body and hers to control. Impulsive, quick to anger, loyal, and self-aware, Max is a memorable character who refuses to give in to circumstances or assumptions. Max loves superheroes, electronics, and messing with the control panels on her wheelchair to gain more speed and power, but her quick temper has her grounded more often than not. . . . Readers will identify with feisty Max and her can’t-hold-me-down spirit. . . . Satisfying. Max loves superheroes, electronics, and drag racing in her wheelchair. When slanderous messages about her grandfather are posted on a Facebook page, Max investigates. She also finds herself deep in the history of Thornwood’s Revenge, a legend in her hometown of Blue Creek, TN. The old Thornwood Manor is supposedly haunted by owner Hargrove Thornwood. As the online messages become more threatening, it seems as if there could be a connection to Thornwood and his fabled revenge on the town. The mystery is well paced with a good balance of action and character development. Though the genre of middle grade mysteries is crowded, this stands out for its authentic and empowering depiction of a young wheelchair user. 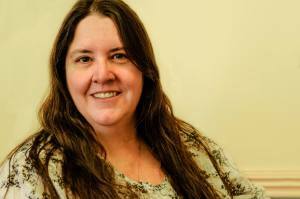 Vaught captures the voice of someone who has spent a good deal of time in a wheelchair and gets the details right. Max is relatable and likeable, and the combination of a spooky old house and a modern cyber mystery will keep readers turning the pages. VERDICT An excellent addition to middle grade shelves, with a differently-abled main character that readers will root for. Maxine (Max) has lived most of her twelve years with her grandfather, the police chief in Blue Creek, Tennessee, in a house adjacent to Thornwood Manor, a seriously creepy mansion whose cruel and miserly erstwhile owner laid a curse on his heirs and his community that has lingered over a century. Now, a hacker with the signature Thornwood Owl is creating social media accounts, slandering the chief and the mayor and blaming them for a sudden escalation in small crimes in the town. Max, who already struggles with anger issues, is having none of this, and she’s also not letting her wheelchair prevent her from solving the mystery, even if it means risking her life investigating the crumbling mansion. . . . Vaught makes Max the brash, bold star of the book, exchanging stereotypes and sympathy cards for a well-drawn character whose disability is part of who she is but not her complete identity; hopefully Max will roll ahead as the advance guard of a literary cadre.